Collectors in Indonesia associate them strongly with Lombok, based on oral tradition. The name there is klewang Sasak , klewang meaning sword and Sasak referring to the Sasak, the main population of Lombok. Most examples in Dutch museum collections seem to have been collected on Java in the second half of the 19th century. 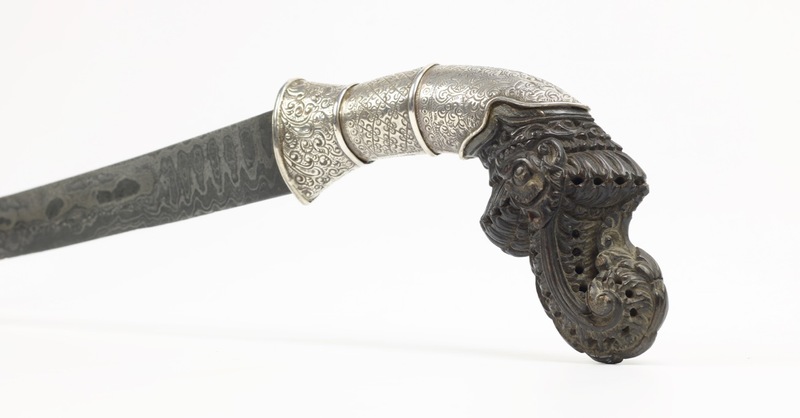 Stylistically, the handles resemble work from Sumatra, especially the piercing and carving on their horn hilts, which resembles work on hilts and scabbard mounts of the better sewar daggers. 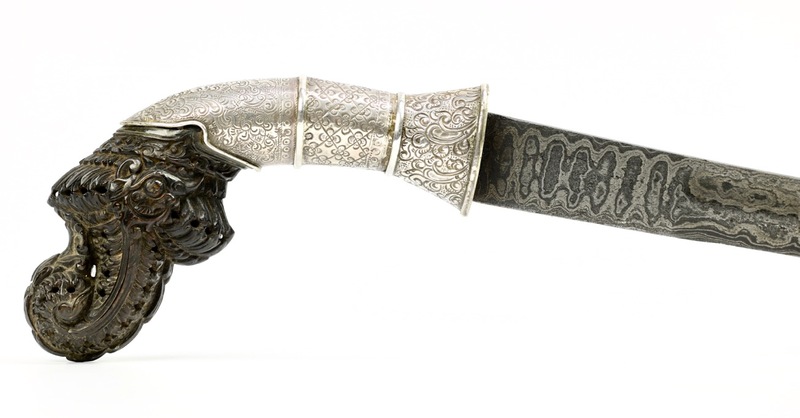 At the same time, the blades sometimes have Balinese or Lombok features, while the silverwork could be Javanese of Sumatranese. Not much is known about the type, and who would wear them. Tend to be rather well made and I suspect they may have been swords perhaps worn by a well-traveled upper-class, representing pan-Indonesian styles. The blade on this example is beautifully made with nicely controlled pamor (patterns in the steel) that exhibits a very active pattern at the base and the tip, with more free flowing lines in-between. It shows exceptional control from the smith's side. The blade has a stone-like, Balinese looking finish. It has a single wide groove that narrows near the tip to make way for a back bevel. The tip droops downward to enable more efficient thrusting. 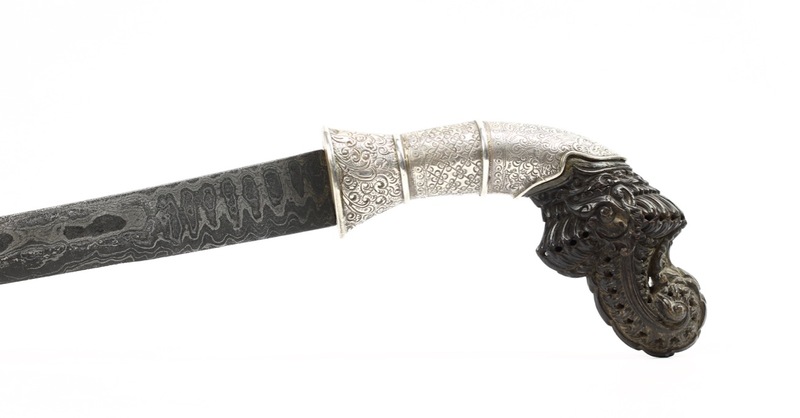 The characteristic hilt is wonderfully carved out of black buffalo horn in a design that seems to represent a rather stylized makara, a mythical creature. 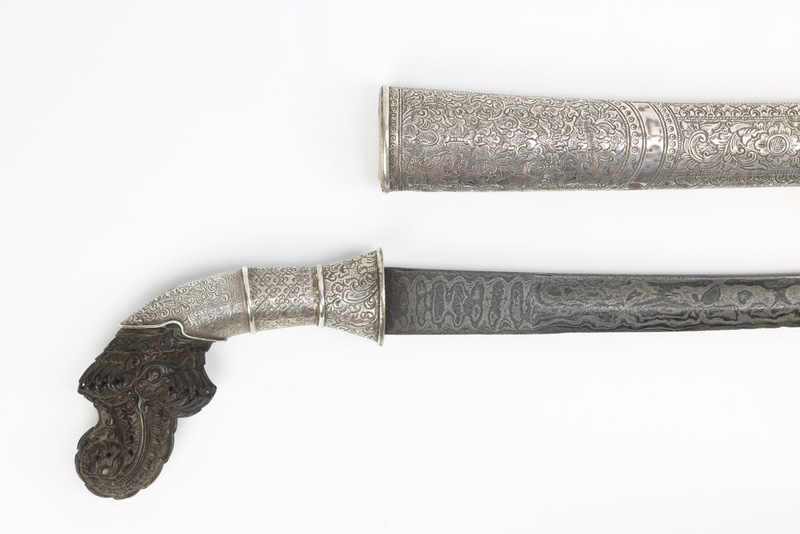 The grip is clad in silver, chased with various decorative patterns. 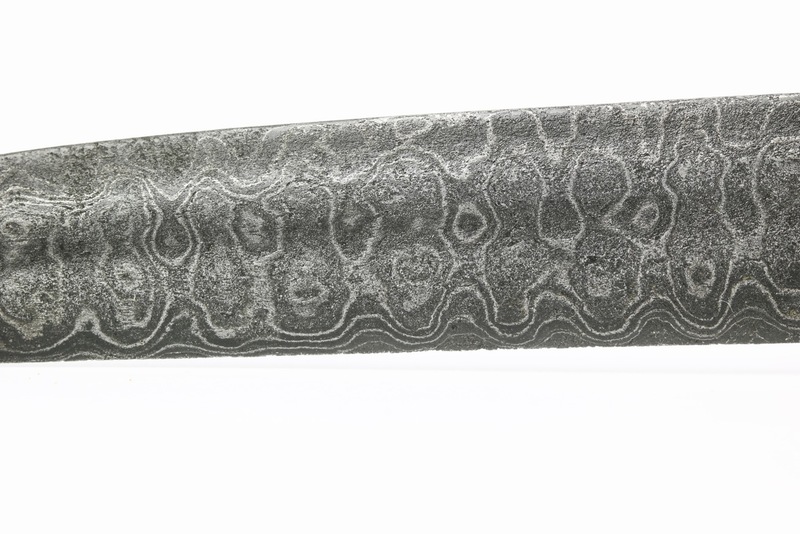 The scabbard is entirely silver-clad and decorated with both abstract geometric and floral designs. It is a fairly heavy weapon for Indonesia, and well-balanced. The blade still strongly smells of incense, which is part of traditional Indonesian blessing ceremonies. 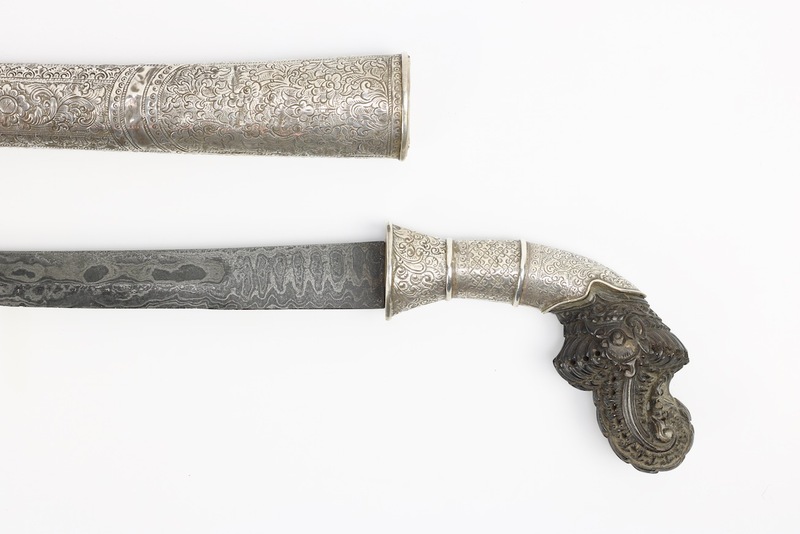 A luxuriously executed Indonesian curved sword, or pedang bengkok . 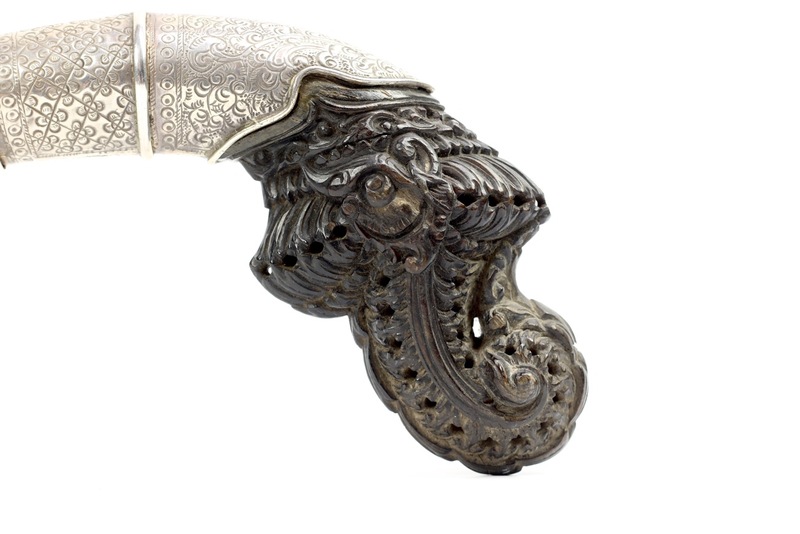 With its tightly controlled and active pattern, fine horn carving and elaborate silverwork this is one of the best example of its type that I have encountered so far. 1. 3. Zonneveld, Albert van; Traditional weapons of the Indonesian archipelago . C. Zwartenkot Art Books, Leiden. Page 102. 2. G.B. Gardner; " Keris and other Malay weapons , Progressive Publishing Company, Singapore, 1936. Page 68.